Underground Racing managed 2,200 horsepower out of the R8. So how will Hennessey respond? John Hennessey seems like the kind of guy that watches the movie Wall Street at every family gathering. Heck, he probably watches it before bed at night because the mantra outlined by villain Gordon Gekko, embodied in the quote “greed is good,” seems to spill over into Hennessey’s pursuit for horsepower. 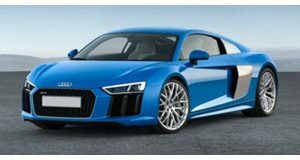 This time around, he has his eye on the Audi R8 V10, a supercar that can gallop on its own two legs just fine without any outside help. But just fine is never enough. Especially when rival tuning outfit Underground Racing saw the R8 galloping on its own four wheels and thought it could do with a few rockets strapped to its back. So it revealed a staged tuning package that allowed the R8 to reach the same absurd lengths as Underground Racing Lamborghinis do. With a bit of help from large turbines embedded in the exhaust canals, the R8 by Underground Racing can make a gut-punching 2,200 horsepower, enough to lay Bugattis to waste. Hennessey is no stranger to doing just that, which it’s proved multiple times with its own Hennessey Venom GT. And using the experience it’s gotten building that car, Hennessey has just announced the R8 Twin Turbo. There's no doubt it’ll contain a good bit more than the stock R8 V10’s 602 horsepower and 413 lb-ft of torque, but just how much more will that be? Knowing how Hennessey rolls, the possibilities are endless, but if power output ends up being in the same neighborhood as the high-powered Underground Racing R8, we’d pray for nothing more than a matchup of the two. All Hennessey had to say before posting mouthwatering pictures of the custom R8 was, "We are excited to build out a twin-turbo engine upgrade for the Audi R8. This is a beautiful car, and a great platform to make much faster. This build is in progress, but before we started, we grabbed some photos to show this beauty off.” We'll wait for the car to do the rest of the talking.